Cadbury's Dairy Milk was behind the public's favourite TV ad of all time, according to research by Marketing. Laurence Green explains what the industry can learn from its success. 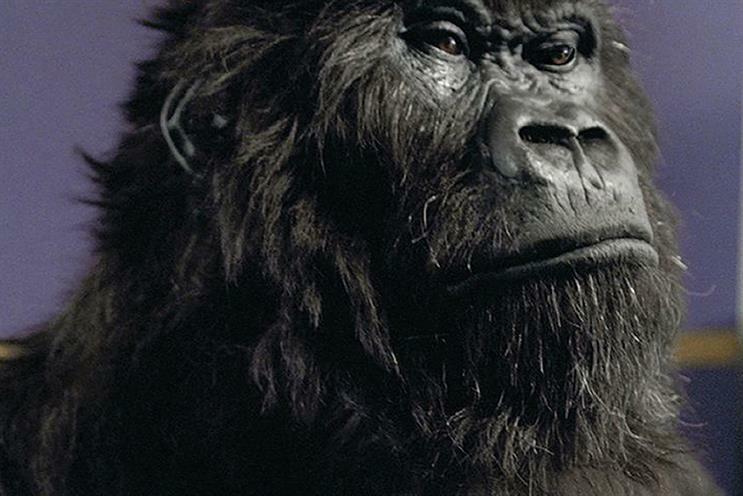 On the basis that an ad isn’t born until sold, "gorilla" drew its first breath in somewhat inauspicious circumstances: in an unremarkable meeting room at a business park in Maple Cross. Fallon had been invited by Phil Rumbol, then Cadbury’s marketing director, to present a complementary TV route for Dairy Milk alongside our sister agency and incumbent, Publicis. A bit awkward, but there you go. The creative set-up was short. We only had a week, after all. Despite a recent salmonella scare, we argued that Cadbury’s stock was such that it could credibly reimagine itself as a producer of joy rather than a mere manufacturer of chocolate. That its "glass and a half" product mnemonic should be repurposed to speak to the brand’s personality instead. And that the idea of "Glass and a Half Full Productions" would hold us to an unusually high bar creatively. The first of these "Glass and a Half Full Productions" would be… this. Rich Flint­ham pressed "play". The famously ominous chords of In The Air Tonight spilled forth. And Juan Cabral gave a beautifully synchronised read of the script that would become "gorilla". No, scrap that, the script that was "gorilla" – because it would barely change from that point on. Even the glimpse of our drummer’s gold tooth featured in that first read. It could have been laughed out of court (some still think it should have been). Instead, the air crackled: first with disbelief and then with palpable excitement. Backs were thumped as we left – a career first. They hadn’t even blinked when we told them that rookie Juan would like to direct his script also. Months of wrangling would follow, with four pretests commissioned by a sceptical board and a puzzled reception from some quarters of the industry even when airborne. Our actual audience, by contrast, gloriously unbothered by "what it all means" (they were just watching telly, after all), chose simply to delight in something absurdly original and absolutely appropriate from a brand that, deep down, they really rather liked. A reminder to us all of that most basic of communications lessons: to be in the audience’s shoes, not your own. The wave of goodwill gorilla" enjoyed from the moment it first aired was all that was needed to move the sales needle – for Cadbury’s chief executive, Todd Stitzer, to declare to investors that 2007 was "the year of the gorilla"; and for a company to start behaving joyfully and instinctively again rather than hiding behind research and "consumer insight". Success has many fathers, of course, and the sceptics quickly changed their tune. There are, as a result, various theories about how we got there and why it worked. The most material, for me, remain the conditions that allowed creativity to flourish so confidently in the first place and, by contrast, the deeply serious intent that underlay the superficial wonkiness. They ran a quick, closed creative review un­burdened by talk of a "pitch" – a label that immediately promotes extraneous activity. This was creative exploration. And they stood by our thinking despite so many of their colleagues, and at least some of their research buddies, throwing rocks at it. Maybe even because of that. But credit also to everyone who worked on it agency side. From Rich’s gossamer touch to Juan’s unapologetically immovable vision. To those who account planned, account handled, produced, post-produced and eventually supplied the bloody thing. "Gorilla" was never creative whimsy. It was a deeply considered response to a great client brief from beginning to end. We committed to a model of how it would work from the very start – something of a prophylactic when those galumphing pretesters came back to tell us it was scoring low on persuasion. We engineered its launch with utter precision, including press ads on launch day to frame it as a cultural, rather than purely commercial, moment. We seeded it expertly before most people even knew what seeding was and we bent with our audience and events in real time in a way that eludes most advertisers almost a decade on. Clients are often described as brave for buying work such as "gorilla". Looking back, I’m not sure that’s right, because implicit in that is the notion of the creative agency as crazy, reckless types, unconcerned by notions of brand stewardship, who might occasionally knock it out of the park by accident. In fact, Phil and his team hired some professionals to do a job. They created the space for us to do so, trusted our intentions, protected us from friendly fire and paid us fairly. It’s no magic formula, but it is the moral of this tale.